Louis Aguirre’s music has been labelled as “Music from hell” and “Not for the faint of heart”. He has achieved international recognition and has been played worldwide, receiving numerous awards and commissions. His output, with more than 150 works, includes: 4 operas, orchestral, solo and chamber music, choral-electronic-didactic and vocal music. Born in Camagüey, Cuba, in 1968, Louis Aguirre was the chief conductor and artistic director of the Camagüey Symphony Orchestra, from 1995 - 2002, as well as guest conductor at the National Symphony Orchestra and the Santiago de Cuba Symphony Orchestra. He also was a professor of Camagüey’s Music Conservatory and artistic director and chairman of the International Festival of Contemporary Music (1996-2002) in Camagüey. Aguirre studied composition with Harold Gramatges and Roberto Valera at the Havana’s University of Arts, and violin and conducting. He also studied at the Amsterdam Conservatory from 2002 until 2004 "Contemporary music through non-Western Techniques” with professors R. Reina and Jos Swaanenburg, and at the Soloist Class in the Århus Conservatory, Denmark, with Hans Abrahamsen, Rolf Wallin and Karl Aage Rasmussen. Louis Aguirre is a strongly individual composer with an unusual spiritual background in Afro- Cuban religion. One of the foremost contemporary cuban composers of today, widely performed and commissioned internationally, the music of Louis Aguirre strikes one with a tremendous blow. It has the power of an exorcism, brutal and impenetrable, and requires the utmost from performers and their instruments. His music is a strange marriage of modernism with the mysteries of the Afro-Cuban Santería religion. Extreme sonorities, irascible micro-tonal melodic designs, frantic sound blocks, complex micro-rhythmic relationships and a wide range of unconventional timbral effects, are some of the components that articulate the exuberant language of Aguirre’s work. (Dr. Iván César Morales Flores Professor i musik ved University of Oviedo, Spanien) Louis Aguirre works as a full-time composer since he moved to Europe in 2001, where he has received numerous commissions and awards. 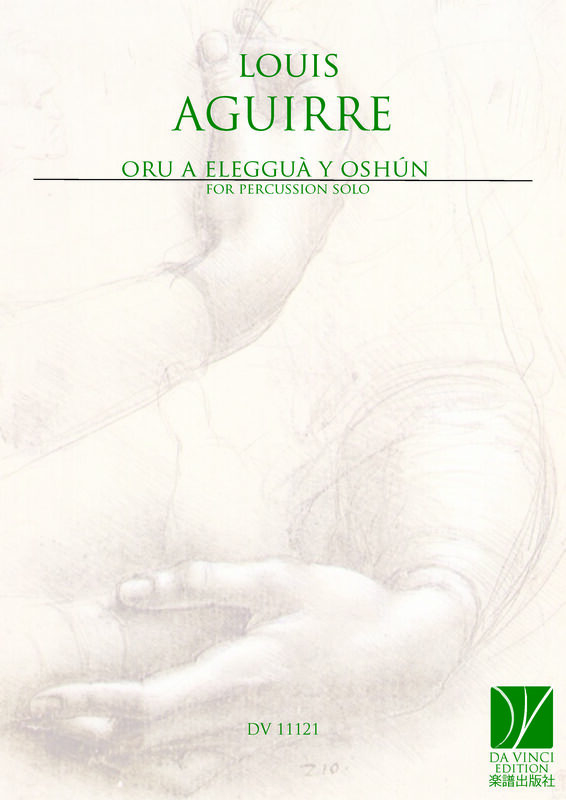 Aguirre has written works for prestigious performers and ensembles such as: Ere Lievonen, Enric Monfort, Adam Ørvad, Carlos Gálvez, Juanjo Guillem, Mikkel Andersen, Barbara Lueneburg, Karolina Leedo, Peter Bogaert, B.C. Manjunath , Sonja Lena Schmidt… , Axyz Ensemble, Arbós Trío, Snow Mask Ensemble, Kimbala Percussion Group, DuoMetrie, Verso Duo, Havana Symphony Orchestra, Santiago Symphony Orchestra, Camagüey Symphony Orchestra, JONDE Orchestra, Spain, Orchestra of the Conservatory of the Balearic Islands, Spain, the Arditti String Quartet, TANA String Quartet, Athelas Sinfonietta Copenhagen, Melisma Saxophone Quartet, Residencias Ensemble, Black Pencil, Neo percusión Ensemble, Colectivo Neo, White Dwarf String Quartet, … His music has been performed at numerous festivals and venues in Europe, China, Russia, Greenland, Australia, Turkey, Canada, the USA and South and Latin America, such as the Internationale Ferienkurse für Neue Musik in Darmstadt; Nordic Music Days, Finland; Granada Festival Internacional de Música y Danza, Spain; Liubliana Festival, Slovenia; Summartónar, Faroe Islands; "Südseite nachts", Stuttgart, Germany; Festival Saint-Denis, Paris, France; Dijon Opera, France; Amsterdam Gaudeamus Week, Netherlands; Klang Festival, Copenhagen, Denmark; GuFeng International Percussion Festival, Hainan, China; XIX Festival de Música Contemporánea de Córdoba, Spain; DeBartolo Performing Arts Center. Leighton Concert Hall, Indiana, USA; RE:FLUX 11. Music and sound art festival. Salle Bernard- Leblanc, Centree Culturel Aberdeen, Moncton, New Brunswick, Canada; Ultraschal Festival, Berlin, Germany; … Louis Aguirre lives in Denmark since 2004, and is a member of the Danish Composers' Society. Also a member of the Snow Mask Composers’ Group and the artistic director of the Snow Mask Ensemble: http://www.snowmaskensemble.dk/medlemmer.htm Among other prizes, in 2015 Aguirre was awarded with the prestigious 3 Years Grant by the Danish State Arts Council. In 2013, Karrusel, a short film with Aguirre’s music and directed by the Russian film maker Marya Yaborska, was selected finalist at the Cannes Film Festival. In 2011 he was the winner (1st prize) of the 2011 Martirano Award, University of Illinois, USA.